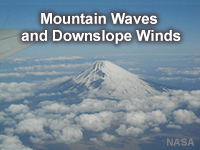 Mountain waves form above and downwind of topographic barriers and frequently pose a serious hazard to mountain aviation because of strong-to-extreme turbulence. This foundation module describes the features of mountain waves and explores the conditions under which they form. Like other foundation modules in the Mesoscale Primer, this module starts with a forecast scenario and concludes with a final exam. Rich graphics, audio narration, and frequent interactions enhance the presentation. terrible. Dense technical information presented in a superficial manner. Recall ability is hampered by lack of context or association. These are excellent trainings, as well as on the job training for me. Great course, with a lot of details that helped me greatly in understanding mountain waves. Looking forward to implement my knowledge in forecasting. Great course- work for National Met Service in UK where we are taught the basics of Mountain Waves without the detail- This is a far more detailed course and gives an excellent overview of a very complicated subject without getting bogged down in excessive Mathematical arguments. Excellent paper and I highly recommend it to anyone wanting an understanding on this subject. Where I live in New Zealand is subject to waves, rotors and the jump zone to near ground level during stable anticyclonic air combined with very cold Bora down slope winds. This has helped me understand it immensely. A1+++++. Thank you MetEd. It's very interesting to go through the module. And there are plenty of examples and pictures to illustrate the theory. It goes rather deep into meteorology, thus very useful for students in relevant majors. It is very good with examples and questions in the module, also some ideas about how to do the real forecast about downslope winds. After completing this module, the learner should be able to do the following things. July 2016: HTML framework updated to latest cross-browser compatibility standards. July 2014: The concepts presented in this module are relevant even though they are demonstrated with older NWP models.